Geekerella is definitely a love letter to fandom. I love any book that speaks to my nerd heart. As a Star Trek, Star Wars (yes both) and Andromeda fan (does anyone remember that show besides me, Kevin Sorbo...come on) I can relate to being a Stargunner. So I enjoy Cinderella retellings but they also really stress me out. I’m always super angry at the step mom and sisters because they are always messing with the protagonist stuff. I get frustrated if she doesn’t steal whatever it is back or doesn’t stand up for herself. Of course this is a fandom thing so I’m like you know nothing about that fandom! How dare you bandwagon for some star! So I definitely was getting the heated emotions. I thought the way the Cinderella story was incorporated is fabulous, right down to the glass slipper. I feel like this story should be a movie, why is it not a movie! Elle and Darien are both great MC’s as we get both of their POV. Which I was grateful for, I couldn’t imagine not knowing what the other was thinking. They have similar qualities as they can both be insecure but also have their own inner strength that needs to shine. I absolutely love Elle and Darien’s interactions, although I kind of wish she said her name was Serena. Ha ha just kidding. The way their relationship starts and how they go back and forth not knowing who the other is. I thought the interactions were so adorkable. Especially since the center mostly around their love of Starfield. There are some really winners for side characters, which always makes me happy. Sage is pretty awesome and an even better friend. I love the way she is comfortable in her own skin and is there for Elle. She is the true blue. Also Lonny and Gail help even out Darien. I enjoyed their presence as well. Plus Jessica, did not expect her but I loved her honesty. Plus The Princess Bride reference of “Have fun storming the castle” which I say all the time and people stare at me. So ya I totally nerded out over the book. Besides me geeking out over every little fandom thing. The book is well written and fast paced. I couldn’t put it down and never once felt like there was a slow point. It completely sucked me in and now I feel like I want to watch Starfield, or maybe read a spin-off of Starfield. (devilish smile). 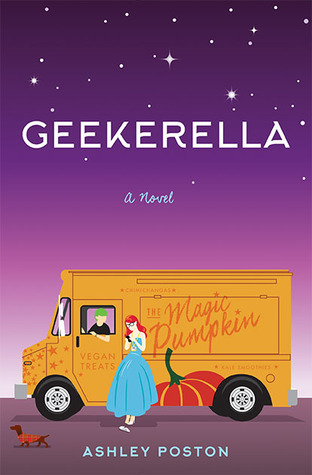 I loved the setting of the convention too and that Elle works in a food truck called the Pumpkin. 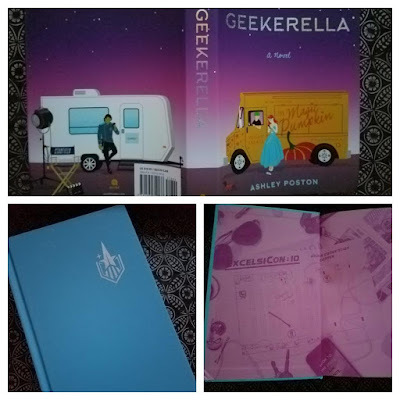 I really loved Geekerella. It’s such a fun read and highly recommend it. Especially with it being convention season now. I think it’s a good way to rev up. 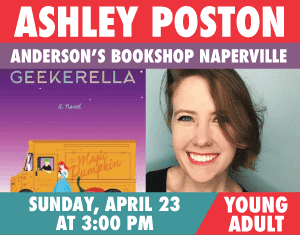 Amy is going to be signing at my local bookstore! Yay! Unfortunately I can't go because I'm working a St. Baldrick's event but even if you don't live in the area you can order a book, have it personalized, and shipped to you. You can call or go online.